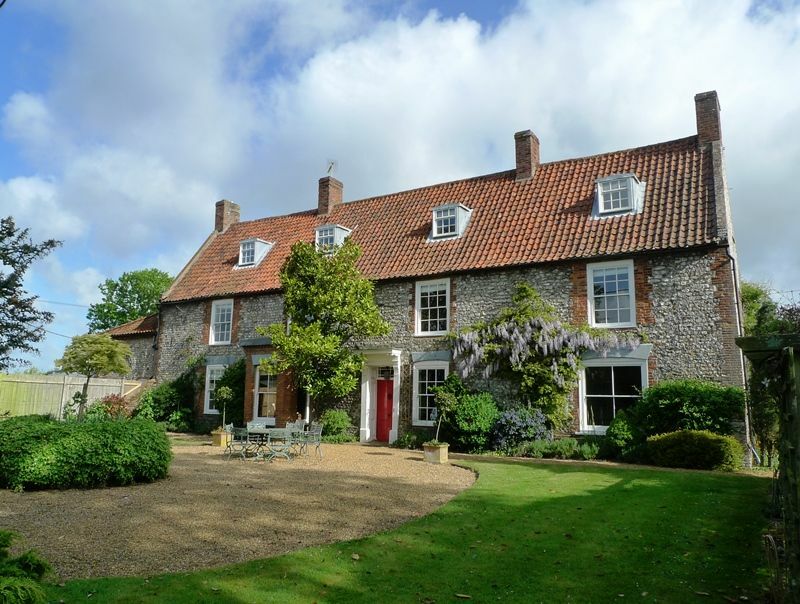 Pond Farm House is a substantial 3-storey Norfolk flint and brick farmhouse overlooking a picturesque village pond, used as a much-loved second home. This is a great place to stay for large groups of family and friends, with plenty of living space in its spacious high-ceilinged rooms, including 6 bedrooms and 5 bath/shower rooms across the 3 floors. Downstairs there is a self-contained annexe, making it ideal for less able guests. Outside there is an attractive walled garden, with sunny spots for dining alfresco or to sit, and watch the wildlife on the pond. For anyone wishing to bring a horse with them, there is a 2 acre paddock available next to the house. It is only a short walk to the excellent King's Head pub/hotel, a village shop and children's playground. The beautiful sandy beaches at Brancaster, Thornham and Holkham may be reached within 15 minutes drive. Please note that the maximum occupation at this property is 13 which includes infants. One well-behaved dog is welcome at Pond Farm House, we're sorry but only a female dog is allowed. NOTE: Whilst the property sleeps 13, guests should be aware that this includes bunk beds which are full size but more suitable for children. Entrance via the back door into a lobby area for coats and boots storage. There is a useful downstairs shower (wet room) ideal for sandy people and dogs! Laundry Room: with washing machine, tumble dryer and sink. Kitchen: charming farmhouse kitchen with original pamment tiled floor and a high beamed ceiling. There is a decorative Aga (not in use), double electric oven and hob, dishwasher, fridge/freezer, microwave, i-pod docking station, Nespresso coffee machine (coffee capsules not supplied) and a kitchen table seating up to 8 people. There's a door through to..
TV Room: comfortable room with an open working fireplace, large sofa and chairs, desk, flatscreen digital TV with complete Sky package, DVD player and the advantage of Wifi throughout the house. Dining Hall: lovely room with a brick open fireplace, high beamed ceiling and original pamment tiled floor. There is a dining table which may seat up to 12 people. Drawing Room: another light and spacious room with big windows looking out across the front garden towards the pond, comfortable large sofas, open fireplace. Annexe Sitting Room: has a sofa, 2 chairs, well-stocked bookcase, TV and door to garden. Annexe Kitchen: well-equipped small kitchen with electric oven, fridge/freezer and a washing machine. Annexe Bathroom: bath with shower over, hand basin and WC. Annexe Bedroom 1: king size bed, bedside tables and lamps, wardrobe. Annexe Bedroom 2: double bed, bedside table and lamp, wardrobe with shelves. The stairs are not steep and lead up from the dining hall. Bedroom 1: wonderful light and airy master bedroom which overlooks the duck pond. There is a king-size bed, bedside tables and lamps, dressing table, wardrobe, fireplace. There is a huge en-suite bathroom: bath, walk-in powerful shower, hand basin, heated towel rail and WC. Next door to this bedroom is a separate dressing room: may be used to put a cot in. Bedroom 2: spacious room overlooking the duck pond with a double bed, bedside tables and lamps, chest of drawers and a built-in cupboard. Bedroom 3: full-size bunk beds and a chest of drawers. Bathroom: bath with shower over, hand basin, heated towel rail and WC. Leads up to large landing with high pitched beamed ceiling. There is a selection of childrens' toys and games. Bedroom 4: spacious room with a beamed ceiling and lovely views across the duck pond. There are twin beds plus an put-up bed, making this room ideal for a couple and a child, or 3 children. There is a shingled drive way leading round to the back of the house where there is plenty of parking space for cars and boats. The garden is mainly at the side and front of the house, with a well-maintained attractive walled garden with lawned area and paved areas. Please note the gardens are not dog proof. There is outside furniture with 2 separate dining tables and chairs in different spots to catch the sun throughout the day. .
Pond Farm House also has a 2 acre paddock which is adjacent to the house, which is ideal for those wishing to bring their horse(s) to Norfolk to enjoy a gallop along the wide sandy beaches. The house is within walking distance of a good local pub, village shop and childrens' playground and also access to the Peddars Way and many other local walks. The beautiful coast is within 15 minutes drive away.